Plus Size Kitten: Free Starbucks Coffee! 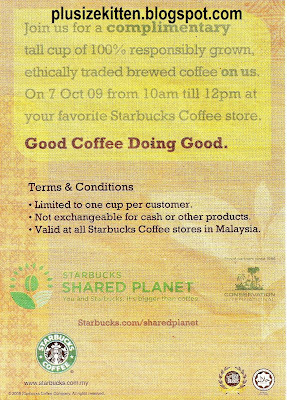 * valid at all Starbucks Coffee stores in Malaysia. aiya.. belum pergi, u leh? 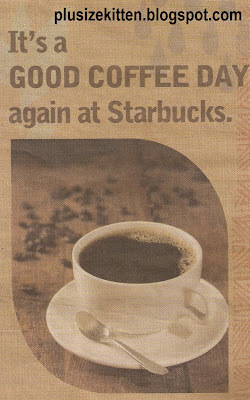 Where got Starbucks is batu pahat, LOL~ well at least I did get my free Starbucks coffee last year @ Starbuck MidValley. Does that count? btw to Sherry, dun think u need to bring the newspaper cutout. Last time I went, there was a throng of thirsty people and the barristars kept on pouring cups after cups without bothering to check in coupons. Tenji Eat All U Can Buffet & Ice-Cream Promotion!